For nearly 50 years Robert S. Flinn, MD, was affiliated with Dignity Health St. Joseph’s Hospital and Medical Center. As a cardiologist and pillar of the medical community, he was one of Arizona’s most influential physicians of his time and held multiple leadership positions at the hospital, including chief of medical staff and leader of the cardiology and electrocardiology departments. Now, 50 years after he and his wife, Irene, founded the Flinn Foundation to improve Arizonans’ quality of life, his legacy continues to make an impact on the hospital he led and served. The Flinn Foundation made a $1-million gift to St. Joseph’sFoundation to permanently endow a cardiology fellowship program. The Dr. Robert S. Flinn Cardiovascular Fellowship Program at St. Joseph’s is a three-year cardiovascular disease fellowship program designed to offer physicians-in-training the advanced education needed to become leaders in the field of cardiovascular care. The program is designed to provide fellows with inpatient and outpatient experience treating patients suffering with various acute and chronic cardiovascular diseases. Fellows will receive broad clinical exposure as well as extensive experience in noninvasive and invasive cardiac procedures.The fellowship program was also created to promote a culture of evidence-based medicine, to teach critical thinking and analysis, and to train fellows to be educators for patients, families and other staff members. St. Joseph’s, the fellowship program and the Flinn Foundation are committed to advancing the quality of cardiovascular care offered within the community, with implications for positively impacting research and practice worldwide. St. Joseph’s Center for Advanced Heart Disease offers cutting-edge preventive care and cardiovascular diagnostic and treatment services designed to provide patients with themost comprehensive, convenient carepossible.The fellows of the Flinn Cardiovascular Fellowship Program are learning and practicing at a center that is a nationally recognized leader in heart and vascular services, consistently achieving top health industry rankings. Every patient receives a personalized treatment plan coordinated by St. Joseph’s multidisciplinary team ofc ardiologists, surgeons, emergency physicians, nurses, patient educators, pharmacists and other healthcare professionals. Research programs support physicians and scientists dedicated to investigating and discovering new and powerful therapies to enhance patient care. Physicians also collaborate with staff at Barrow Neurological Institute to support stroke prevention, treatment and research.The center is home to advancedcardiac imaging, a cardiac catheterizationlaboratory, cardiac MRI, cardiac telemetryunit, cardiodiagnostics, cardiothoracicintensive care unit, cardiothoracicoperating rooms, high-resolution cardiacCT scanning and other innovative heartand vascular technology.The Flinn Foundation’s generousendowment will allow physician-scientiststo broaden the center’s services andresearch capacity, and expand the field ofcardiovascular medicine for the benefit ofcountless patients here in Arizona andbeyond, for many years to come. 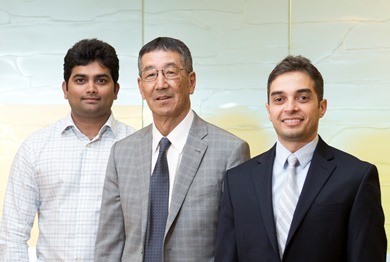 Vice President of Academic Affairs Jeffrey Sugimoto, MD, (center) welcomes the 2016 fellows of the Dr. Roberts S. Flinn Cardiovascular Fellowship Program to St. Joseph’s Hospital and Medical Center. Charan Yerasi, MD, (left) completed his internal medicine residency at Medstar Georgetown University Washington Hospital Center. He received his medical degree from Gandhi Medical College, where he was awarded Distinction Honors in Biochemistry. Saifuldeen Al-Qaisi, MD, (right) was chief resident at St. Joseph’s Hospital and Medical Center Internal Medicine Residency Program, where he was also named Resident of the Year. He received his medical degree from the University of Baghdad College of Medicine. 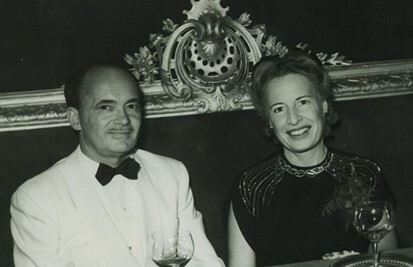 The cardiology fellowship program was established in recognition of the 50th anniversary of the Flinn Foundation, a privately endowed grant-making organization founded in 1965 by Dr. Flinn and his wife, Irene. Located less than a mile from St. Joseph’s Hospital in the center of Phoenix, the foundation’s core mission is to improve the quality of life in Arizona, with a focus on advancing medical education and biomedical research. Interested in supporting the mission to advance medical education at St. Joseph's? Donate now or call 602.406.3041.